If you are on the hunt for a last minute quick and easy idea for Memorial Day or July 4th this Patriotic Fruit Kabobs Recipe will save the day. I was on the hunt for a few last minute ideas for this weekends grill outs (we have two this weekend). The hubby and I were brainstorming and decided to whip up something easy. We have so many other errands and household projects needing to be accomplished leaving no time for real cooking. I know these Patriotic Red, White and Blue Fruit Kabobs will be perfect. 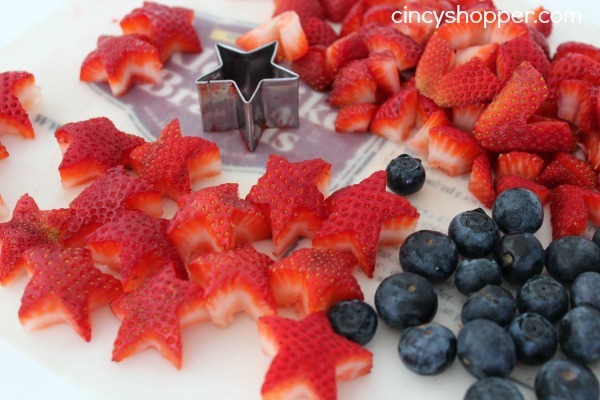 These Red, White and Blue Fruit Kabobs can be made with or without the strawberries cut into stars. 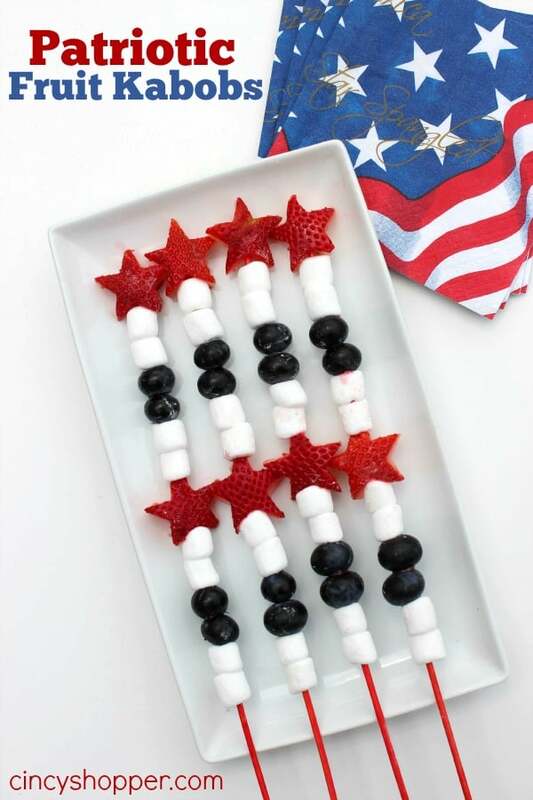 I wanted to add the extra Patriotic flair to our Patriotic Fruit Skewers. I used my very tiny star shaped cookie cutter (I found mine at Hobby Lobby). 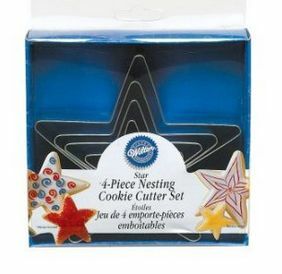 You can also snag this Wilton Stars Nesting Metal Cutter Set on Amazon. If you are talented you could probably cut the star shapes yourself. Just grab some skewers and your berries. We used blueberries and strawberries but you could also use raspberries if you choose. Oh and do not forget your marshmallows. 1 1/2″ Star Cookie Cutter. Find 10 largest strawberries, remove stem and cut in half. Using star cookie cutter make 20 marshmallow stars. Lightly grease skewer with butter up to the point where you want marshmallows to start. Push 2 marshmallows down to that point. 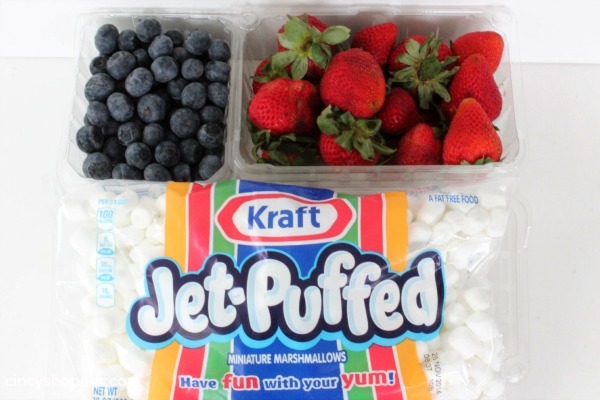 Push 2 blue berries down to marshmallows. Push 2 marshmallows down to the blueberries. Push 1 star down to the marshmallows. Push 2 marshmallows down to the star. Push 1 star just onto the tip and align other items up to bring together. Repeat for other 10 skewers. If you are looking for other great Memorial Day and July 4th ideas be sure to follow my July 4th Pinterest Board. Also, check out all of My Recipes for other great ideas (I will be adding new ones thru July 4th). 1 1/2 " Star Cookie Cutter. This is such a cute and fun idea! Yummy too! Thank you bunches for linking up and partying with us! These are adorable! They’d be perfect for a Memorial Day/4th Party! You have a new follower! I love this special Ka Bob treat! Thanks so much for sharing with Full Plate Thursday and have a great weekend! 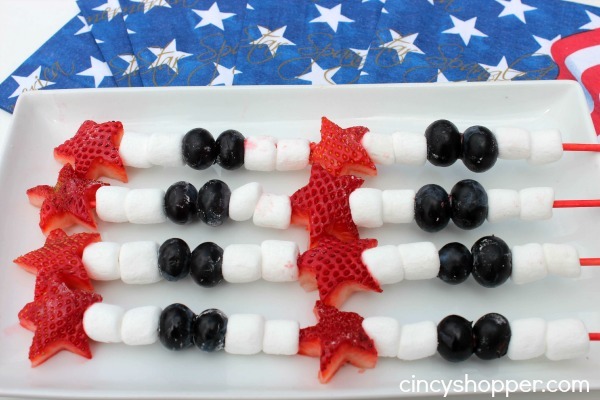 Your Patriotic Fruit Kabobs will be featured on Redhead’s KItchen tomorrow! Thanks for linking up to Inspiration Monday Party! Hope to see you back this Sunday!